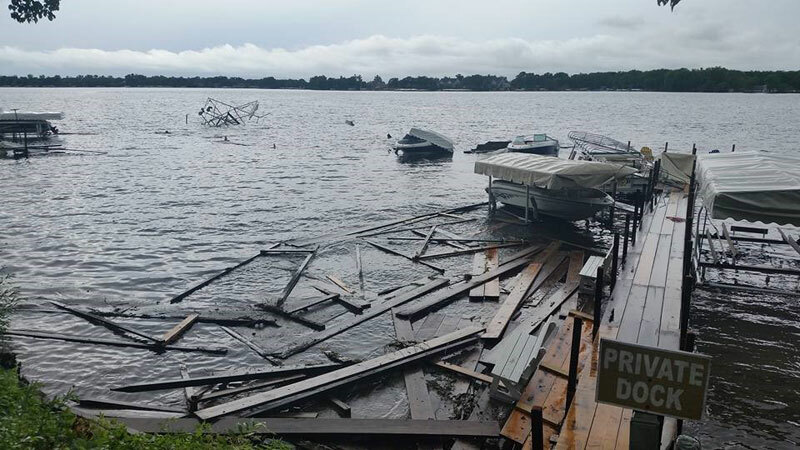 Storm damage at Lake Okoboji. Damaging winds, torrential rains, flash flooding in seven counties and a brief tornado were reported Tuesday afternoon and evening in Iowa. Dickinson County Emergency Management Coordinator Mike Ehret says the tornado touched down eight miles south of Lake Park. The other buildings on the property were not damaged. “It was a pretty weak tornado, but it did throw the debris out into the field a ways and lofted some of it up in the air,” Ehret says, adding some of the debris was found a mile away from the acreage. At about 3 p.m. Tuesday, strong winds tore the roof off a mobile home in Spirit Lake and knocked down power lines in Spirit Lake and Milford. 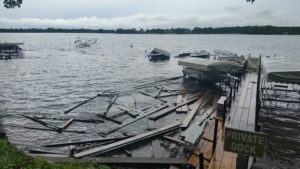 Docks were damaged at Lake Okoboji. Nearly four-and-a-half inches of rain fell in Elma, a town in Howard County. Four-and-a-quarter inches of rain fell in Monticello. Hopkinton got just over four-and-a-tenth and a trained National Weather Service spotter reported four inches of rain fell in Dubuque. The National Weather Service reports flash flooding in Mitchell, Floyd, Howard, Cerro Gordo, Chickasaw, Dubuque and Jackson Counties.